This three stone ring Design has 2 large round brilliant diamonds one on each side of the head and 8 more round diamonds bead set with 4 on each side of the engagement ring. The wedding band has another 13 round diamonds. 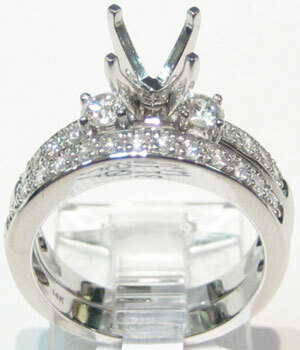 The total carat weight is 0.68ctw. It is 14k white gold but can be ordered in platinum or yellow gold.